is the accumulation of plaque around the abutment. The consequences are the inflammation, the bone loss around the implant and the final loss of the implant. In 2010, Dr. Awillo developed a method involving the use of biocompatible properties of zirconia. In vitro studies were conducted for two years, with the Department of Mikrobioanalytics of the University of Warsaw. These studies showed a high adaptive capacity of connective tissue cells fibroblasts to the surface of zirconia. In this case report, the reconstruction of a missing central incisor combined with severe bone loss is presented. After dental trauma in the childhood of the patient, the tooth #11 was root canal filled and replanted. At the age of 21, tooth #11 presented a root fracture, witch led to massive bone loss and loss of the tooth. A four-stage surgical protocol using an autologeous bone graft and connective tissue graft, followed by an implant with all-ceramic crown, was planned. Although the case took a considerable amount of time, and several procedures to bring to conclusion, a stable and aesthetic result was provided. Objectives: The present study aimed primarily to explore the cone angle of in vitro CAD/CAM conic crowns in pursuit of reversible retention in fixed implant-supported prostheses as an alternative to cement- or screw-retained prostheses. It further sought to develop predictive models for clinical applications. Materials and Methods: Eight sub-sets of CAD/CAM specimens consisting of an abutment and a coping with cone angles that varied from 1 to 8°. The retention surfaces of the elements were designed to provide very close contact between them. Five specimens were fabricated per angle and the retention strength was measured (in newton) five times for each specimen on a Zwick/Roell testing frame. The findings were analysed statistically with classical exploratory and descriptive tests of the quantitative variables, as well as with analysis of variance tests: Anova followed by Tukey multiple contrasting; and estimates models, calculating R2 parameters and goodness of fit. Results: The mean retention strength values found, in descending order of cone angle, were as follows: 8°: 21.02 N; 7°: 23.16, 28 and 36.40 N; 6°: 40.46 N; 5°: 66.36 N; 4°: 61.23 and 76.12 N; 3°: 93.44, 103.21 and 112.04 N; 2°: 154.20 N and 1°: 204.74, 261 and 293.40 N. These data described a curve from which two predictive models were developed to find retention strength from the cone angle used and the cone angle that would be needed to deliver a given retention strength. Conclusions: On the grounds of these findings and subject to the limitations of in vitro studies, the conclusions drawn were: in CAD/CAM conic crowns, the smaller the cone angle, the greater the retention strength; predictive models can be developed for both cone angle and retention strength; and lastly, this line of research opens the door to a wide field of future studies. Implant stability is one of the principal factors in the clinical success of implant therapy. Research has shown that one of the major causes of falilures in osseointegration is excessive micromovements, althought to date, there is no clinical available method for measuring micromovements. The primary objective of this study was to use a 3D DIC method for clinical full-field tridimensional surface micromovements measurement of endosseous implants. Secondarily, this work aimed to understand the influence of different factors in the occurrence of micromovements, particularly the change in the prosthetic abutments geometry (Standard [SD] and Platform-Switching [PS]). In this study 32 endosseous implants (Camlog Biotechnologies®, Wimsheim, Germany) inserted in rehabilitated patients with two or more adjacent dental implants in the lower posterior jaw, and with two different abutments SD (N=18) and PS (N=14), were used. Micromovement measurements were performed by 3D DIC with two high speed photographic cameras and the video correlation system Vic-3D 2010 (Correlated Solutions®, Columbia, USA), after the application of a bite load of more than 30N, measured with a miniature compression loading cell (Applied Measurements Ltd., Berkshire, UK) and the system design software LabVIEW 2010 (National Instruments®, Texas, USA). Implant stability was also measured clinically in ISQ (Implant Stability Quotient) using the Osstell® ISQ (Osstell® ISQ Integration Diagnostic, Sweden). The results were statistically analyzed with the software IBM SPSS® Statistics 20.0 (SPSS Inc., Chicago, Illinois, USA). The results obtained seem to be correlated with the ISQ values indirectly measured by RFA (Ressonance Frequency Analysis) with the Osstell® ISQ. In conclusion, within the limitations of this study, 3D DIC method is capable to measure dental implants micro-movements, although not being a clinical system. The results obtained show correlation with the RFA system, and Prosthetic abutment geometry did not influence the occurrence of micromovements. Introduction: The need for increased bone availability in the posterior maxilla for placement of dental implants, led Tatum and Boyne, in the 80s, to describe the lateral access technique to regenerate the maxillary sinus. Later, Summers proposed a crestal access to regenerate the maxillary sinus, allowing to place implants in the same surgery. Currently, several authors suggest a crestal access whereby implants are placed without using biomaterials in locations with less than 4-5mm bone height, which are covered completely with bone spontaneously, where the implant apex itself maintains the sinus membrane elevated producing the "tent phenomenon". Objectives: The aim of the study was to evaluate bone formation obtained by implant placement using an osteotome and trephine technique and the survival rates in areas with an availability of less or equal to 5mm of bone. Material and methods: 32 implants were placed in locations of 5mm or less bone availability. Using a trephine, the site is prepared to a distance of 1 mm to the cortical sinus floor. After this, this part is fractured with an osteotome. Finally, the implant is placed. Standardized periapical radiographs, at 0, 6, 12 and 18 months for the measurement of newly formed bone were taken, and data of initial bone availability, sinus shape or Valsalva maneuver were related. Results: All 32 implants were successfully osseointegrated. The baseline mean bone availability was 3.69mm, with a range of 2 to 5mm. The mean achieved bone gain was 3.84mm. The Valsalva maneuver was positive In 8 cases, influencing bone formation, particularly in the distal implant apex. In all of the cases, spontaneous bone formation was observed, and this was stable over time. Discussion: The spontaneous bone formation observed in all cases, especially when the Valsalva maneuver is negative, simplifies the surgical approach to the maxillary sinus, avoiding regenerative techniques, and reducing the treatment time. The 100% implant survival rate coincides with other studies published in the literature. The mean bone gain of 3.89 mm is consistent with results from other studies. Background: The identification of variations in bone levels (BL) from one radiographic examination to the next is time-consuming and highly dependent on examiner training. Traditional measurements rely on the identification of the first bone-to-implant contact, which is prone to inter-examiner variability. This study validates a digital method for detection of BL around dental implants. 1. Image segmentation was based in a series of automatized steps to isolate the crestal bone and the implants aiming to compute the bone-implant intersection. They consist in the application of filters, edge detectors and histogram thresholding, proceeded by a series of morphological and bridge operators. It finishes with the application of previously trained Active Shape Models representative of the implant profile that adapt by iteraction to the enhanced structures in the image. BL are computed by calculation of the distance between the intersection of the implant and crestal bone and the implant shoulder. 2. Method validation: Two examiners analysed 60 radiographs of Camlog® Screw-line implants with a graphics user interface developed for the segmentation method. The results of the computed BL were analysed for disagreement between observers for internal validation. Accuracy was determined by comparison of the results with the matching manual readings. Results: No differences were found between the measurements obtained manually and by either of the two examiners using the automatized method F(2, 186)= 0.16, p=0.852. Reliability analysis of the measurements obtained by the three raters revealed an intraclass correlation coefficient of 0.839 [0.783-0.884, 95% CI], p<0.01. More than 60% of the measurements were considered perfect hits. Conclusions: The new proposed method has proven to be a reliable and accurate tool for BL measurement, contributing for the reduction of inter-examiner variability. Background: One of the greatest challenges in implant clinical trials is the correct appraisal of bone levels throughout the trial span. This poster describes a technique to produce individualized X-ray positioning devices for obtaining optimally projected intraoral radiographs of dental implants with long term stability. Materials and Methods: An X-ray positioning device was built for Gendex® Visualix® eHD sensor, using the Dentsply rinn XCP-DS® system individualized by the incorporation of the bite piece within an acrylic stent to perform successive standardized radiographs to patients. X-ray tube stabilization was achieved with polivinylsiloxane. Series of 3 radiographs were taken to each patient in different moments. Specific linear measurements as the implant diameter (mesio-distal width) and the height between consecutive threads (thread pitch) were made using the software Image J 1.46r to all radiographs to determine the reproducibility and accuracy of the procedure. Image corregistration was also performed on every pair of radiographs. Results: The intra-class correlation coefficient for the mesio-distal width was 0.964 [(0.920 - 0.986) 95% CI] (p < 0.01) and 0.990 [(0.976 - 0.996) 95% CI] (p < 0.01) for the thread pitch. Conclusion: The customized sensor holder produced images proper for radiographic examination of dental implants in different moments, allowing the reduction of radiation dose given to the patient. Objective: Bisphosphonate-related osteonecrosis of the jaw (BRONJ) is a side effect of bisphosphonate therapy. Dental implants are believed to be a risk factor for developing BRONJ. In the present study we analyze the time span of developing BRONJ in patients treated with bisphosphonate and receiving dental implants. 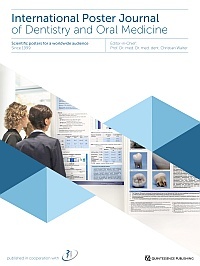 Study design: Patients with dental implants and established BRONJ at the Medical University Clinic of Vienna and studies from 1978 to 2012 were included in a meta-analysis. Three groups were created: a) implantation before bisphosphonate treatment, b) implantation after bisphosphonate treatment, c) implantation during bisphosphonate treatment. Outcomes were evaluated by linear regression analysis. Results: Patients who underwent dental implantation during (p<0.001) and after treatment with bisphosphonates developed BRONJ more rapidly (p<0.001). The duration of treatment with oral bisphosphonates was significantly related to the rapidity of developing BRONJ (p=0.03). Conclusion: The insertion of dental implants during or after bisphosphonate treatment accelerates the development of BRONJ. BRONJ occurs less frequently during oral bisphosphonate treatment and dental implantation. Implant-supported overdentures with retentive attachments are reliably being used in the treatment of restoring complete edentulism in daily practice. There are different approaches regarding the number of implants required and type of connectors to achieve satisfactory retention and stability in such indications; however, placing a minimum of 4 implants in the maxilla and placing 2-4 implants in the mandible can be regarded as a widely preferred treatment approach by the clinicians. There are limited studies in the literature investigating Locator attachments as retentive agents for dentures in the treatment of total edentulism, although the system was introduced to dental market first in 2001. The aim of this case study is to present clinical solutions in the treatment of 11 edentulous cases with Locator attachments applied on Camlog dental implants and share prosthetic and retentive attachment related complications for a mean follow up period of 38 months. In eight cases the individuals were treated with 4 Camlog implants in each jaw, in two cases 4 Camlog implants in the maxilla and 2 in the mandible, in one case 2 implants were placed in the mandible only. Locator attachment supported final dentures were applied after completing the universal osseointegration periods of 12 and 6 weeks for the maxillary and mandibular implants respectively and the individuals were followed at 6 month-intervals for implant or prosthetics related complications. No complications regarding implant survival or loosening of the Locator abutment itself were noted, however, weakening of denture stability due to attachment parts wear at 6 month follow-ups were encountered and resolved by replacing the plastic cap in the metal housing as provided. From the result of this case study of a mean follow up period of 38 months, it can be stated that Locator attachments function effectively as retentive agents for dentures in the treatment of total edentulism. They allow easy handling to the clinician for chair side denture application and also allow easy seating and removal of the denture by the patients. Objectives: The reconstruction of dentoalveolar defects has been a challenge for surgeons. Extensive loss of bone and teeth presents a complex problem for reconstruction. The aim of this study was to evaluate the clinical and radiographic outcome of early loaded Camlog implants placed in atrophied partially edentulous jaws reconstructed with autogenous onlay bone grafts taken from the mandibular symphis or ramus. Material and methods: A total of 21 Camlog implants (Camlog Biotechnologies, Basel, Switzerland) in 19 patients were installed in the grafted areas were evaluated. The implants were placed after major vertical or horizontal bone augmentation (or both). After osseointegration, patients were treated with implant supported fixed partial dentures. The patients were recalled for 5 years period. Results: The implants were in function and clinically stable when tested individually; the periimplant soft tissues were clinically healthy. Periimplant marginal bone loss was in clinically acceptable levels (0.32 mm at 5 years) and the patients were satisfied with the prosthetic outcome. The clinical results reported here has shown several procedures may be necessary for the rehabilitation of the patients with extensive bone loss. Conclusions: Augmentation of the alveolar bone with an onlay bone grafts provides the desired gain of bone, allows for the ideal placement of dental implants, and improves any discrepancy between the upper and lower arches. As a result early loading of Camlog implants in augmented bone reveals satisfactory results. Objectives: An interdiciplinary approach is often indicated in the planning and treatment of patients who have anatomic deficiencies in soft and hard tissues due to a congenital disorder. Succesful treatment of such patients may include osseointegrated implants to increase prosthesis retention and stability. This clinical report describes the treatment plan of a patient with congenital disorder whose several teeth and supporting tissues were lost. Material and methods: A 34 year- old man was referred to Marmara University Dentistry Faculty for dental rehabilitation. The patient's history included a congenital disorder which affects the facial and intraoral appearance and mandibular opening. Several different restorative options were discussed with the patient and the patient expressed a desire to keep as many of the remaining teeth as possible. In the maxillary arch, a removable partial denture (RPD) with extracoronal ball attachments was selected for esthetics, function and ease of oral hygiene maintenence. The mandibular arch was primarily affected by the defect with the presence of scar tissue and the absence of alveolar ridge and adequate vestibule. Therefore, to provide retention and meet the esthetic requirements, in the mandibular arch, an implant-supported hybrid prosthesis was planned over 5 implants and the single tooth with a telescope crown. Results and conclusion: At the 2-year follow-up, all implants were stable and the maxillary removable prosthesis with precision attachments and the mandibular hybrid prosthesis did not have any complications. Implantation in the aesthetic zone is demanding procedure, both in terms of functional and aesthetic. In order to achieve long-term stable therapeutic effect, keratinized gingiva of implants should be thicker than the one of the natural teeth. Objectives: Comparative, ultrasound evaluation of the thickness of keratinized gingiva around implants before and 3 months after augmentation gingiva by means of connective tissue graft and collagen matrix Mucograft® (Geistlich®). Results: In comparison of all groups the highest value of increasing thickness of gingiva in 3 measurement points in IIIb group (with connective tissue graft 3-month after implantation) was recorded (the differences were at a point 1-0.69, 2-0.80, 3- 0.56 ). The greatest thickness of gingiva in 1 measurement point was observed in IIb (0.86). In Mucografts group the higher increase was recorded in IIIa group. Conclusions: Both CTG and Mucograft® has the effect of increasing gingiva thickness, but higher values have been recorded after augmentation surgery with CTG. In thin biotype when keratinized gingiva is thinner than 2 mm, implant surgery of keratinized gingiva is required. The guidelines for working with matix Mucograft® must be observed and obeyed. Background: The platform switching (PS) concept refers to the discrepancy between smaller diameter prosthetic abutments related to implant platform diameter and clinically seems to prevent the crestal bone loss and maintain soft tissue levels. However, it is well-known the lack of well-designed prospective randomized clinical trials evaluating the efficacy of platform switching versus platform matching (PM) placed in partially edentulous mandibles. Aim: The purpose of this five-year prospective randomized multicenter study was to assess the differences in bone level changes and success rates between CAMLOG® SCREW-LINE implants supporting single crowns in the posterior mandible restored either with PM abutments or abutments with PS. This paper presents interim results obtained up to two years. Material and methods: Patients ≥18 years old missing two or more adjacent teeth in the posterior mandible and with a natural tooth mesially to the most proximal implant site were enrolled in this study. Free end situations were allowed and opposing dentition must be natural teeth or fixed restorations. Following implant placement patients were randomized either in the group for PS or for PM restorations. 67 patients (8 of them split-mouth) with 160 implants followed-up to two years post-loading were included in this interim report. The distance from implant shoulder to first crestal bone contact, at mesial and distal side, was measured with standardized radiographs and statistical evaluation of significant changes in crestal bone levels between the two abutment types over time was performed with a two-sided t-test of means from the parallel group design. Results: The PS group showed a trend for less bone level change at two years post-loading. Conclusions: At two-years post-loading the implants restored with PS abutments appear to preserve the crestal bone more predictably than the implants restored with PM abutments. Inferior alveolar nerve injury (IANI) is one of the distressing complications that may occur during implant placement resulting in sensory disturbances accompanied by decreased patient life quality. Hence dental practioners should be aware of nerve injuries and recognize them as early as possible to start an adequate therapy to avoid liability claims. In terms of increasing forensic implication a suitable tool to objectify clinical findings is the Quantitative Sensory Testing (QST). It is a non-invasive, valuable method According to the quantitative sensory testing protocol implemented by the German Research Network on Neuropathic Pain (DFNS), patients who had obtained an implantation in the lower jaw with Camlog® implants combined with augmentation procedures were examined. The aim of the study was to investigate whether implant surgery could lead to sensory deficits in trigeminal nerve function depending on the proximity of implant placement to the inferior alveolar nerve even if patients do not notice any sensory disturbances. The radiological examination showed no protrusion or crossing of the implant bed or implant in the alveolar nerve canal although proximity to the inferior alveolar canal was evident radiographical. Neurophysiological examinations were carried out in the early postoperative period rating changed sensory perception and taste disturbances. Purpose Statement: A unique attempt to create a next generation of a surface treated dental implant. Introduction: After the initial enthusiasm and interest in hydroxyapatite products subsided due to dissolution of the coatings and failure at the coating interface, this was a unique attempt to create a next generation of dental implant. Materials and Methods: The adhesion property of AW and HA coatings at various temperature by pulsed laser deposition was assessed on titanium plates. Indigenously prepared dental implants were coated with AW/HA by pulsed laser deposition and was implanted in the femur of rabbits . Histomorphometric evaluation was done at various intervals. Results: Decohesion load was more for AW in scratch test and more bone formation around AW coated implants on histological evaluation. Discussion: AW coating by pulsed laser deposition was more adherent to the titanium surface and led to faster bone formation than HA. Conclusion: This experiment opined that AW coated by pulsed laser deposition seems to be a promising method in achieving bioactive coatings on titanium implants. Objectives: The aim of this study was to prospectively assess clinical and radiological results in a group of patients treated with Camlog implants supporting mostly single-tooth, and partial restorations. Material and Methods: In this study, patients were treated with implant (Camlog Biotechnologies, Basel, Switzerland) supported all ceramic single crowns and followed for 1 year. The implants were evaluated by clinical and radiographic parameters. Clinical parameters like plaque index (PI), sulcus bleeding index (BI), peri-implant probing depth (PD), and marginal bone loss (MBL) were recorded. Repeated-measurement ANOVA, Kruskal-Wallis test, Wilcoxon signed rank test and paired samples test were used for statistical analysis. Results: Twenty-six implants were placed in 21 patients. At the recall examinations, all implants were successfully integrated, demonstrating healthy peri-implant soft tissues as documented by standard clinical parameters. The mean MBL at baseline was 0,98 mm ± 0,51 at mesial side; 0,88 mm ± 0,40 at distal side. The MBL reached to 1,24 mm ± 0,58 at mesial; 1,11 mm ± 0,46 at distal side at 1 year. The difference was statistically insignificant. Soft tissues were clinically healthy. The mean PD at baseline was 2,95 mm ± 0,59 and increased to 3,19 mm ± 0,77 at 1 year but the difference was statistically insignificant. Conclusions: Camlog implants in the anterior zone reveal successful clinical and radiographic outcomes when ideal treatment steps are performed. Clinical and radiographic outcome of Camlog implants in partially edentulous cases after an observation period of 10 years. Objectives: The aim of this clinical study was to evaluate the outcome of 253 Camlog implants in the posterior maxilla and mandible in 67 patients after 10 years of functional loading; to report the incidence of the most common technical problems, in implant-supported fixed partial dentures (FPDs), and to and assess the survival and success rate (event-free survival) after 10 years of function. Materials and Methods: Patients with missing posterior teeth were treated with implants and follow-up examinations were scheduled 1week after suprastructure placement, after 6 months and annually for 10 years. Clinical parameters like plaque index (PI), sulcus bleeding index (BI), peri-implant probing depth (PD), and marginal bone loss (MBL) were recorded along with any biological and mechanical complications at baseline and recall evaluations. Repeated-measurement ANOVA, Kruskal-Wallis test, Wilcoxon signed rank test and paired samples test were used for statistical analysis (p=.05).Complications with implant supported restorations were recorded. Success was defined as event-free survival. Survival and success probabilities were estimated with the Kaplan-Meier estimator. Results: In 67 patients, a total of 253 implants were placed and restored with 143 implant-supported FPDs (63 single crowns, 80 FPD bridges). Cumulative implant survival rate was 100 %. At 10 years, the mean PD value was 2.33 (0.58) mm, and MBL was 0.35 mm. The survival rate of FPDs supported by implants was 97.94 % after mean follow-up oat 10 years. The success rate (event-free survival) of the FPDs was 96.9%. Conclusions: Fixed partial dentures supported by Camlog implants showed high clinical and radiographic outcomes and low technical complications rates at 10 years. Objectives: To maintain periimplantary biologic width by fabricating an individually designed non-functioning definitive lithium disilicate abutment without the need of removal for prosthetic stages and to compare the clinical outcome with its symmetrical conventional individualized abutment application. Materials and Methods: One-stage surgery with two bone level implants (Conelog; diameter: 3.8 mm and height: 11 mm) was conducted on a patient with bilateral maxillary lateral incisor congenital absence. An immediate definitive lithium disilicate abutment (e.max CAD abutment solutions, MO, Ivoclar Vivadent) was manufactured by CAD/CAM (Cerec MCXL, Sirona) and placed at one side on a titanium base (Conelog T-base, Camlog) and temporized by a composite resin build-up. The contralateral side was left for conventional healing and after four months, an individualized abutment was prepared, likewise. At the end of four months, definitive leucite-reinforced glass-ceramic crowns for both sides were fabricated (Empress CAD, Ivoclar Vivadent) and luted (Multilink hybrid abutment cement, Ivoclar Vivadent).The patient was followed-up for gingival contour and papillae formation for 9 months without any complaints. Conclusion: Both sides revealed successful gingival contour and health regardless of immediately placed definitive abutment concept or conventional healing followed by definitive restoration. Objectives: Current approach in individualized abutments is to use titanium bases (Ti-bases) for supporting lithium disilicate ceramic abutments to achieve both esthetics and mechanical resistance against intraoral forces. Ti-bases might lead to greyish reflections from the highly translucent glass-ceramic abutments. To avoid this, an opaque luting resin cement use for adhering the individualized glass-ceramic abutment to the titanium base might be a solution for this clinically overlooked situation. The aim of this study was to compare two resin luting cements with different opaqueness on the final colour of lithium disilicate abutments supported by titanium bases. Materials and Methods: Twenty titanium bases (Conelog Ti-base, Camlog) were divided into two lutin gresin cement groups (n=10/group) (Panavia F 2.0 (P), Kuraray; Multilink Hybrid Abutment Cement (M), Ivoclar Vivadent). Twenty identical monolithic abutment crowns with a standard ceramic thickness of 2 mm in the gingival portion were milled out (Cerec MCXL, Sirona) from lithium disilicate blocks (e.max CAD abutment solutions MO, Ivoclar Vivadent). Ten abutment crowns for each cement group were luted to the titanium bases according to the manufacturers' instructions. A dental contact type spectrophotometer (Vita Easyshade, Vita Zahnfabrik, Germany) was used to measure the mean colour differences of both cement groups before locating the abutment crowns on titanium bases and after luting on these bases by CIE Lab formula. The interaction of ∆E values were analyzed by a one-way analysis of variance at 5 % level. Results: The final color of the abutment crowns were significantly affected by the M cement (P<0.05). Cement M resulted in less color difference than P (P<0.05). Conclusion: The final color of lithium disilicate abutment crowns was influenced from the opaquness of the luting cement. Objectives: The aim of this experimental study is to evaluate the accuracy of the MExPERT IPM (implant planning model) and the surgical drill guide fabricated from that model. Material and methods: DICOM data from a CBCT (MESANTIS line I; ISI, Hatfield, USA) and STL data from a plaster model scanned with the model scanner D700 (3Shape, Kopenhagen, Denmark) were matched with each other in a specific implant planning software (MESANTIS 3D Studio). Based on the matched data an implant for tooth 36 was planned with a patented new approach. In the base of the virtual model four precise wholes were placed as reference markers. The distance of the sagittal markers was 30.000 µm and the distance of the transversal markers was 25.000 µm in the virtual model. Subsequently, acrylic models were printed with Scan LED (MOVINGLight®) technology (D35, Prodways, Les Mureaux, France). All printed IPMs were evaluated with the high-end scanning system CONTURA G2 (Carl Zeiss, Oberkochen, Germany). To assess the basic accuracy of the IPM the sagittal and transversal distances of the reference markers were measured. After repeated placing of the Camlog sleeve holder (= IPM marker) in the planned hole of the printed IPM the vertical variation of the IPM marker was measured. In addition, the variation of the IPM marker angulation in the sagittal and transversal plane was evaluated. In the second part of the study the fabricated implant guide was evaluated with the same parameters. Results: The mean deviation of the MExPERT IPM was 101 µm (= 0,33%) in the sagittal and 24 µm (0,4%) in the transversal dimension. Repeated positioning of the IPM-Marker on the MExPERT IPM was associated with a vertical variation of 37µm. The angular deviation of the IPM marker in the sagittal dimension was 0,33° and in the transversal dimension 0,77°. In the fabricated implant guide the vertical position of the Camlog sleeve varied 163 µm. The mean angular deviation of the sleeve in the implant guide was 0,4° in sagittal plane and 1,15° in transversal plane. Conclusion: When compared with other scientific studies the MExPERT IPM Camlog seems to be the most accurate and economical implant guide for safe and fast implant placement. Since early 2013 the standardized implant cases are treated based on the new iSy implant concept in our dental clinic. With this comprehensive review, we would like to introduce our concept and present a tabular statistic on the 1-year cases. Implantation has established itself in dentistry and osseointegration of the implants is regarded as secured. New concepts should make the treatment processes simplify and shorter. In the development of iSy-Implant Concept were set value at particularly on a simplified system and treatment procedure as well as a full integration of digital technologies and cost-reduced solutions with a high quality. After iSy- and our concept, this applies to cases without augmentation and with the possibility of transgingival healing. Any change to this simple concept leads to additional works and increased costs and contradicts the innovative basic idea of this concept. Introduction: Edentulous sites in the posterior maxilla are often compromised by reduced bone volume, prohibiting the placement of 10-mm implants without sinus augmentation. The use of shorter implants minimizes the need for more extensive sinus floor elevation, thus reducing treatment duration and morbidity. This simplified treatment modality can make implant rehabilitation of the atrophic posterior maxilla more accessible and more acceptable to even the most unwilling patients and referring doctors. In this case a 46-year-old patient was referred to the Department of Prosthodontics, University of Marmara with edentulism in the posterior maxilla. The implant site was evaluated with CBCT (Cone Beam Computed Tomography). After the consultation it was decided to place implants and fabricate a fixed partial prosthesis. The bone volume at the left side was not found to be sufficient because of pneumatization of the maxillary sinus. It was decided not to perform a sinus lifting operation and to place short implants instead. So the long implants in combination with short implants (Conelog® screw-line implants, Biotechnologies, Basel, Switzerland) were placed. Total and lower vertical facial height was determined with cephalometric analysis and Niswonger two-point method. Temporary restorations were fabricated in this appropriate vertical dimension and used for eight weeks. Permanent metal-ceramic crowns were fabricated with using CONELOG® Esthomic® abutments. Conclusion: The use of short implants, 7mm in length, in combination with minimally invasive sinus floor elevation, where necessary, provides clinicians with more conservative treatment options, and helps minimize treatment duration, costs and trauma. These benefits, along with the safe and predictable use of short implants, should make implant therapy accessible to a greater number of patients and practitioners.